Bundle includes 6 Champion Sports Rhino Skin Neon Dodgeball Set Purpleand with 1 Performall Lanyard. When you want the best you want Rhino Skin«.áRhino Skin« balls feature a tough coating over a durable foam core.áThe ORIGINAL, non-sting coating is designed and made in Sweden and is so durable, it is virtually tear-proof! The Rhino Skin« patented coating provides better performance than traditionally constructed balls, offering ease of play that is excellent for all age groups.áWhy settle for a substitute when you can haveáRhino Skin«á-áthe best brand on the market! dodgeball is great for agility, throwing and catching exercises, which is why you need the proper equipment for the game. Perfect for all ages, our Rhino Skin« balls offer the ultimate in safety and fun for a multitude of game styles. Our 6 low bounce dodgeball features an ultra durable Rhino Skin« non-sting coating that is perfect for indoor and outdoor activities. 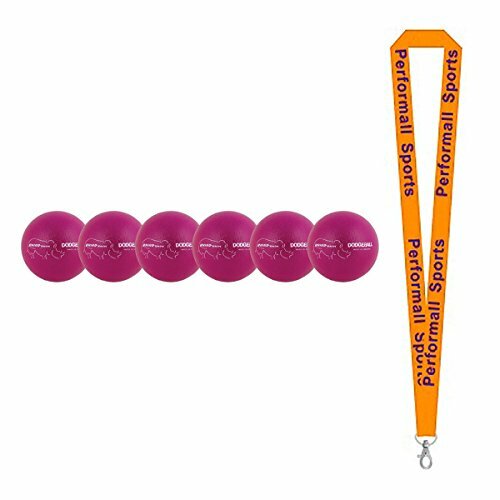 Bundle includes 1 Performall Sports Lanyard.